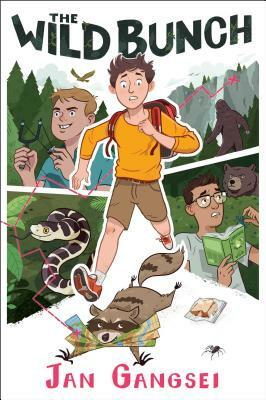 Three unlikely friends—brainiac Hector, bullish Jack, and sarcastic Paul—find themselves braving the wilderness in search of the mythical Beast of Bear Falls in this hilarious MAX novel. As far as Paul Adams is concerned, the idea of a weekend camping in the nearby state park with his dad’s two college friends and their sons, Hector and Jack, sounds like a nightmare. But even he finds the myth of the Beast of Bear Falls—a legendary Bigfoot creature—intriguing. The trip gets off to a rough start, and calamity and disaster follow catastrophe. Against all odds, arguing most of the way, the crew face all sorts of obstacles natural and man-made. Can the three boys make it to Bear Falls and uncover the truth about the Sasquatch living there? Jan Gangsei grew up in the hills of Vermont, where she began her career as a journalist and photographer. After stints in Key West, New York City, and Barbados, Jan finally settled with her family in Northern Virginia, where she writes full time. Her debut novel, Zero Day, is a political thriller set in her backyard of Washington, DC. She is also the author of The Wild Bunch.